W. Bradley, C. Jennings, eds., Chaos: Tauba Auerbach, New York, 2009, p. 7 (illustrated in color). J. Hasting adn B. Schwabsky, eds., Vitamin P2: New Perspectives in Painting, London, 2011, p. 34 (illustrated in color). Oslo, Standard, Emily Wardill/Tauba Auerbach/Camilla Low, February-March 2009. -J. Hoffmann, Vitamin P2 New Perspectives in Paintings, 2011, p. 34. Ever inventive, bridging high art and design with the new modes and mediums of the Information Era, Tauba Auerbach creates work that is both sensual and mathematical, melding the bold, heroic assertions of late Modernism with the cool and careful syntactics of Post-modernity. Crumple IV - one of seven from her 2008 Crumple series -presents the viewer with a canvas of tightly-packed black Benday dots recalling Bridget Riley's Op-Art masterpiece, Fission (1963) or the Pop Art of Roy Lichtenstein, shorn of irony. At over six feet high, Crumple IV engulfs the view with its commanding scale and dazzling optical buzz. 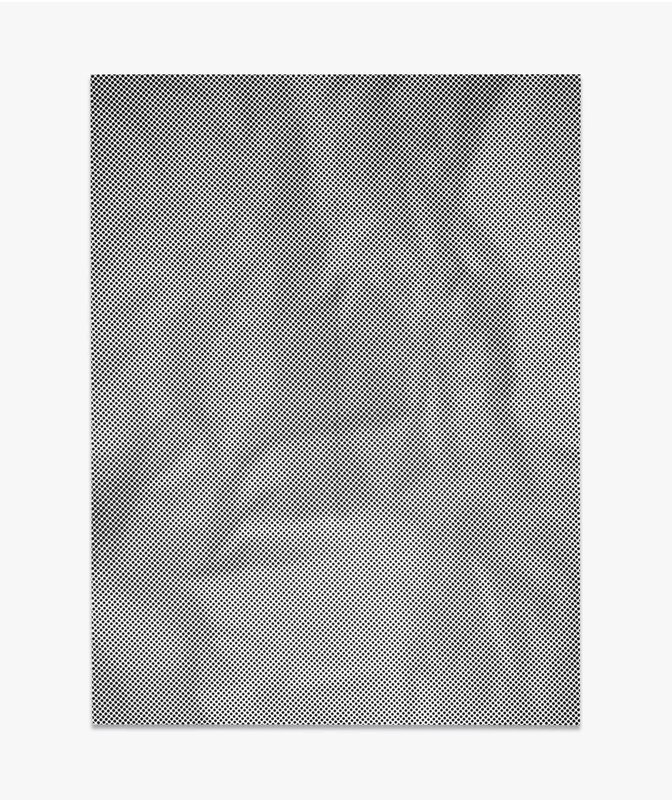 Monochromatic from afar, the canvas appears as though it has been wadded up and crinkled, only to be re-stretched on a frame, creases intact. Upon closer inspection, what appeared rumpled at a distance is as taut and smooth as any other canvas. Its dots emerge and the surface seems literally to vibrate and pulsate as the eye strives to apprehend its true composition. And yet, Auerbach eschews the kind of optical illusion that so often exhausts itself once the trompe l'oeil is comprehended - the Crumple series has layers to spare. It is, in fact, a transposition on canvas of a photograph of a piece of crumpled paper, reproduced with UV inkjet and fused with a pointillist field of acrylic black dots. Auerbach's process is thus as important to her Crumple series as its abstract visual textures. Wit marries instinct, culminating into a work that operates between order and chaos. Auerbach's process both informs and belies first impressions, revealing a rigorous conceptual framework upon closer inspection. Should viewers find themselves second-guessing, that is by design. As Auerbach explains, she hopes to provoke in her viewers "confusion and then clarity and then confusion again." (T. Auerbach, quoted by L. Turvey, "Art in Review," ArtForum , September 2009, p. 230). Surface ambiguities - a hallmark of abstraction - obey a cool, meticulous logic underneath, placing Auerbach in close kinship with artists such as Brigit Riley and Sol LeWitt, whose exercises were similarly exacting. So, too, does Auerbach's process give a nod to Art History -particularly in her experiments melding painterly abstraction with industrial, post-Warholian print-making. Gerhard Richter's Strontium (2005) - named for a synthetic substance used to make fake diamonds - is a clear referent, as much for its underlying method as for its repeating pattern of dots and illusory depth. Other points of reference would of course point to Roy Lichtenstein and Sigmar Polke's dot paintings that emerged from the 1960s. For as large as Lichtenstein looms over any work that uses the Benday dot, works like Polke's Don Quixote (1968) provide the more apt analogue. While Auerbach clearly fetishes and magnifies the aesthetics of mass print and design culture like Lichtenstein did, she activates those obsessions in a way more closely aligned with Polke - as a means to question and undermine the stability and authority of the printed image. Hers is above all a visually tactile oeuvre that the invites eye to probe and caress its surfaces, however illusory. Crumple IV resists passivity and avoids narrative. That she has updated ideas like Polke's for today's age of digital manipulation makes her work all the more poignant and exciting. Auerbach's work exists in a rarely explored, ambiguous territory, in which the artist intersects mathematical, logical and art historical concerns and interlaces them into a rich tapestry unifying both surface and space. As Jeffrey Deitch describes as "[her work is] instilled with conceptual rigor and philosophical challenge. She has been able to update the type of conceptual structures in the work of an earlier generation of artists like Sol LeWitt to the digital age... extend[ing] the tradition of modern abstraction painting into a contemporary context, both conceptually and formally' (J. Deitch, The Painting Factory: Abstraction after Warhol, exh. cat., Museum of Contemporary Art, Los Angeles, 2012, p. 7). As one of today's most talked-about and original artists, her work has found homes in exhibitions at the Museum of Modern Art PS1, New York; San Francisco Museum of Modern Art, San Francisco (where Crumple II resides in the permanent collection); the New Museum, New York; Castello di Rivoli Museum of Contemporary Art, Turin; and The Whitney Biennial, Whitney Museum of American Art, New York, among others. Combining impulse and calculus, abstraction and tech savvy, her work is beautiful and beguiling, "collapsing order and chaos into a unified state." (T. Auerbach, quoted in D. Kazanjian, 'Optic Nerve', American Vogue, January 2009, p. 141). "Auerbach further questions the strength of the divide between order and chaos in her 2008 Crumple series. These works recall the 1960s Op art matrices of Bridget Riley, yet Auerbach's paintings have conceptual underpinnings. In this series, the 'optical' pattern is derived from photographs of crumpled paper, which are meticulously reproduced with painted black dots. In her illusionistic two-dimensional representation of a three-dimensional quality, Auerbach challenges the limitations of dimensionality and presents the possibility that order and chaos are inextricably intertwined." -M. Norton, 'Tauba Auerbach', 2010 Whitney Biennial cataloge, exh. cat., Whitney Museum of American Art, New York, 2010, p.24.